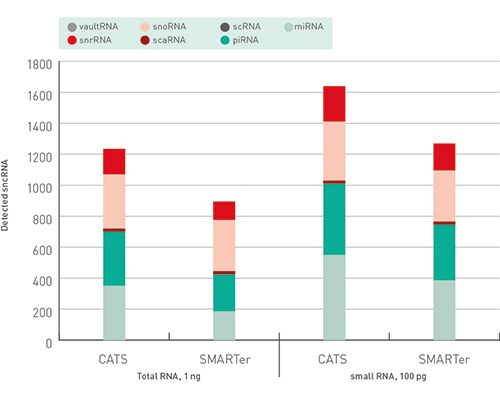 Add CATS Small RNA-seq Kit x12 to my shopping cart. 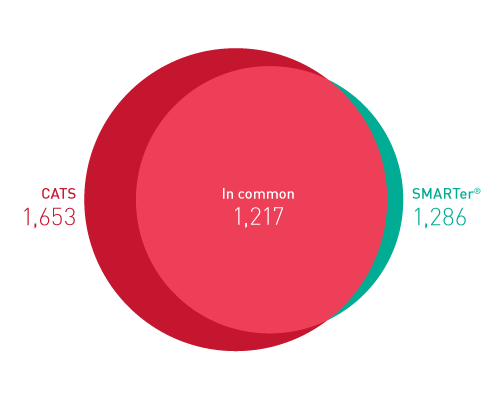 Diagenode’s CATS small RNA-seq Kit utilizes the innovative “Capture and Amplification by Tailing and Switching” (CATS), a ligation-free method to produce DNA libraries for next generation sequencing from low input amounts of RNA. CATS relies on polynucleotide tailing for capturing the 3’-ends of nucleic acids and the template switching ability of MMLV-RT to capture the 5’ ends for cDNA synthesis. This kit allows for generating Illumina compatible ready-to-sequence libraries from RNA inputs as low as 10 picograms in just few hours. 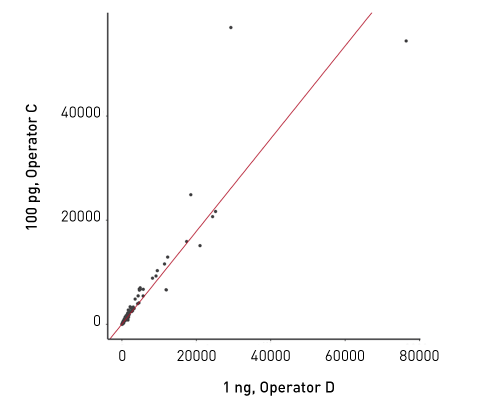 Correlation between 2 different operators using CATS small RNA-seq Kit on two different inputs (100 pg vs 1 ng) for ncRNA detected at TPM ≥2. Input: 100 pg isolated small RNA. TPM ≥2. Transcripts taken into consideration: miRNA, piRNA, scRNA, scaRNA, snoRNA, snRNA and vaultRNA. 1,217 transcripts found in both libraries at this expression level. 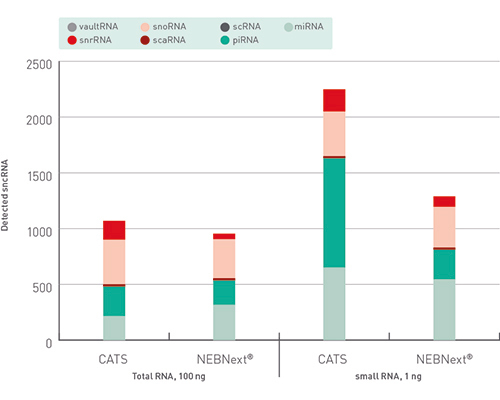 Representation of detected transcripts different biotypes with CATS small RNA-seq Kit vs NEBNext UltraI kit. TPM≥2. 1 ng total RNA, 100 pg small RNA used as input. 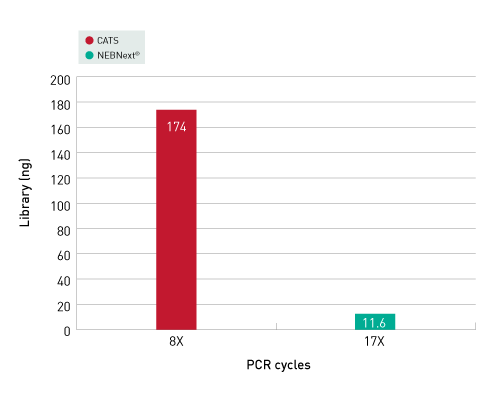 Representation of the library preparation yield according to different methods (CATS small RNA-seq Kit vs NEBNext UltraI kit) for 100 ng total RNA. Number of PCR cycles applied following manufacturer’s instructions. 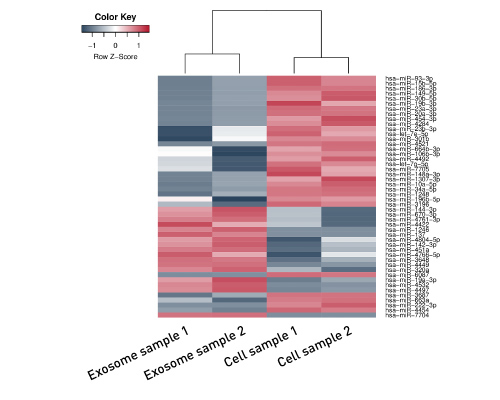 Representation of detected transcripts different biotypes with CATS small RNA-seq Kitvs NEBNext UltraI kit. TPM≥2. 100 ng total RNA, 1 ng small RNA used as input. CATS RNA-seq Kit on 1 ng total RNA from parent (HEK293T) cells (Cell sample 1, 2). Given the low input range of up to 1 ng of our cell free plasma derived small RNA samples, commercially available kits and various published protocols failed in generating a library suitable for NGS with attempts resulting in high concentrations of adaptor dimer or failed library amplifications. In light of this, we are more than happy to have tested the CATS small RNA-seq kit by Diagenode. Even with limited input material we got a rich library with absolutely no detectable adaptor dimer, as expected given it is a ligation free method. The kit performed superbly, in contrast to other commercially available kits or published protocols, with less hassle and with a greater ease of use. Highly recommended for anyone who is struggling with generating a library from low input and challenging samples. Diagenode strongly recommends using this:	CATS Small RNA-seq Kit x12 (Diagenode Cat# C05010044). Click here to copy to clipboard.